Anyone who reads the words of Jesus above will easily understand that there are only two choices. The first one is narrow, difficult, and treacherous, but is one that leads to life. The second one is wide, easy, and safe, but leads to death. The answer is clear. We want life, not death. We want the good, not the bad. We want the easy, not difficult. So we pick and choose. If you are like the people who prefer the fruit but not the cost, you will want all the goodies, all the rewards, all the accolades that come without hard work, without the cost, and without having to lift up a finger to work for it. How nice it is, to be able to have both the cake and eat it as well. So some Christians come up with a brilliant idea. Why not have the goal of eternal life, and then manufacture a path of easy, convenient, and comfortable journey? Why not come up with a middle way? The biggest problem in mainstream practice of Christianity is not whether we understand the merits of the narrow way or the dangers of the wide way. The biggest problem is that we have convinced ourselves that there is a third way, a Middle Way which takes the best of the narrow way (the reward) and the best of the wide way (the easy path), and imagines it exists right between the narrow and the wide ways. This Middle Way is deceptive and dangerous. A) What is the Middle Way? Simply put, the middle way is somewhere in between the narrow way and the wide highway. It can be imaginery, or it can be something fixated in the minds of people. On the one hand, the destination is the wonderful heavenly treasure and eternal heaven. On the other hand, the journey is one of easy and convenient highway. Put them all together and we get the middle way. Easy right? More gain, no pain. Getting more for ourselves that demand less of us. The middle way is having the easy traveling path of the highway that will lead us to the heavenly destination of eternal life. It is the receiving of wide forgiveness from God, without the narrow requirement of our repentance. It is the easy baptism into membership of any Church we choose without sensing any need to obey the rules and disciplines of membership. It is the easy taking of weekly communion without the tough act of confessing our sins. It is the easy display of soft love without the corresponding courage to exercise tough love. It is easy to call oneself a Christian, and then ignore the cost of discipleship. The middle way attempts to take the best of both worlds, and ignore the worst of them. It believes that with the latest technology, the most competent management structures, and the wide range of expertise at our hands, we can overcome the most difficult terrains by using the easiest and greatest scientific knowhow. For too long we have been spoilt by an all-conquering, know-it-all, attitude of supremacy and excellence. After all, we justify ourselves into believing that God has given us everything easy, and since all the difficult stuff have been shouldered solely by Jesus, Christians nowadays are no longer bound by the law, and is free to be anything they want to be. There is no need for the law anymore as we are all "under grace." Through the Middle Way, we deceive ourselves thinking that we can continue to sin because grace has paid everything. We are ready to shoot down every argument to obey the law, by saying that obedience to the law equals legalism. The trouble with this argument is that Jesus Himself does not claim to destroy the law but to fulfill them. Moreover, the law is for lawbreakers, for sinners. Unless of course, we can turn around and say that we are perfect and pure, sinless and totally innocent. Fact is, we are not. That is why the law is still necessary for keeping us sensitive to any acts of sin, and then to avoid, to stop, and to mortify the sinful selves. Let me share three ways in which the Middle Way is commonly practiced. A brilliant strategy taken by those walking the "Middle Way" is to just talk about it only. They argue at length. They analyzed the depths of the material. They study, they debate, and they convince themselves that they have known the truth. Then they stop. After the discussion, they close their books, they go home, and nothing changes. Life goes on, until the next study session where they re-ignite the discussion without the need to apply what they have learned, or to obey what they have been taught. 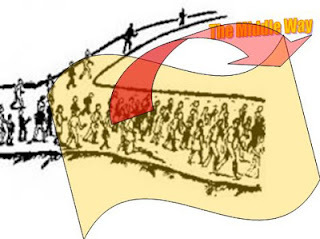 Long time Bible study groups are most prone to this first manifestation of the Middle Way. I know of many groups that keep talking and arguing over the same old thing, year in and year out. The material may change. The leader may change. Unfortunately, the hearts of the people remain unchanged, unmoved, and unable to go beyond talk-only. KEY: We practise the Middle Way when we are interested only in talking but not obeying what we have learned. The second strategy of people taking the Middle Way is the mantra: Minding My Own business. I obey only the parts of Scripture that benefit me. As long as it is for me, I will do it. If it is for others, I stay out of the picture. Religion for me then is private and confidential, comfortable and quiet. If it is too difficult, either wait it out, or search for an easier option. Take the Great Commission for example. How easy it is to say that the words of Jesus are only to the disciples who saw Jesus at that time! Why ruffle the feathers? Live and let live. If we do not meddle into the spiritual lives of other people, other people should not meddle into my own spiritual lives. If the pastor does not preach a message that I like to hear, I will leave. I can easily find a Church that I can enjoy being present without any commitment. KEY: Obedience entails commitment. Commitment to obeying Christ always is a mark of discipleship. Don't know what to obey? Perhaps, you've NOT been reading your Bible. Finally, the third strategy of the Middle Way is to get everything without paying any cost. The days of the martyrs are over. Such a thinking typically makes one believe that one is the exception rather than the rule. God can call others to give up everything, but I am the exception. I am the odd one out. I am the special and unique case. It is true that the great reformers like Martin Luther, John Calvin, Ulrich Zwingli, John Wycliffe, and others are called, but God didn't call me. It is also true that the modern heroes of faith have given up their lives for the gospel, like the Jim Elliots, the Hudson Taylors, the Jonathan Livingstons, and many others. Not me. Not small little me. After all, who am I compared to these giants of faith? How can I even compare to Billy Graham or Jonathan Edwards? There is only one Tim Keller, and I am no Keller. There is only one CS Lewis, and I am no Lewis. Hey, I am not even from an Ivy League University! It is easy to rationalize ourselves out of God's calling and God's will. It is easy to take the middle way of comfortable living and expect the heavenly reward on the basis of God's grace. KEY: There is no discipleship with the cost. 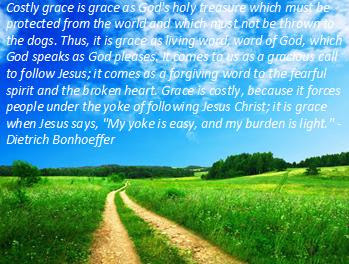 Grace is free. Obedience is not free. Here is my point. The Middle Way is a cop-out for non-action. It is a deceptive manner in which we think we are obeying God by simply rationalizing our lack of obedience with all kinds of reasoning. Then we come back complaining about our lack of spiritual vitality, how boring church is, and what small faith we have. I shudder. Let me close with this parable of warning. In Matthew 25:14-30, Jesus tells of a master who gives the first man 5 talents, the second man 2 talents, and the third man 1 talent. The first man takes the 5 talents and faithfully earned another 5. Likewise, the second man gained two out of his two talents. The master praises the two men, "Well done, good and faithful servant!" For the third man, look at the excuse. This third man thinks he has been kind to the master by not losing the one talent. Instead, the master reprimands him, "You wicked, lazy servant! So you knew that I harvest where I have not sown and gather where I have not scattered seed? Well then, you should have put my money on deposit with the bankers, so that when I returned I would have received it back with interest." My readers, this third man practices the middle way. He keeps the one talent safe, and adopts the easy path of doing nothing. At the same time, when he comes to the master, he presumes erroneously that the master is going to be happy with his easy going disposition. Wrong! The master is not only disappointed, but angry at the lack of desire to be faithful and to be fruitful. Are you practicing the Middle Way? Are you burying your talents? Are you involved in committees and groups that talk only without walking the talk? Are you content with simply a life of non-commitment? Are you rationalizing yourself into a life where there is no necessity to pay any cost at all? If you are doing that, let me remind you, there is no middle way. There is only a narrow path or a wide path. The default path is the wide path. The Middle Way is the wide path. The non-committal way is the wide path. Refusing to choose the narrow path is to remain in this default path. For when we choose the narrow path, it will be grace that will lead us home. THOUGHT: If you think the Middle Way is the new narrow way, think again.